I have used hydrogen peroxide as part of Sick Tree Treatment to cure Rose Rosette on Knockout roses and various diseases like powdery mildew on crape myrtles and early blight on tomatoes. Our pool maintenance guy recently advised that our salt-water pool was full of mustard algae. These are rare algae reported to have come from Mount St. Helens. I asked why our salt system was not controlling it. The salt system produces chlorine from the salt, but apparently neither chlorine from toxic chemicals nor from salt will control these algae. My guy and others in the pool business said the only thing that will work is toxic chemistry products like copper sulfate and sodium bromide. Not in my pool! I asked about hydrogen peroxide; would that work? The answers were consistent no’s, that peroxide was just an oxidizer and would do nothing. Well, I thought about the experts and the university web sites that say no to hydrogen peroxide curing Rose Rosette and other diseases. They were wrong about that, why not this? My pool guy agreed that we should give it a shot. I had some 33% peroxide product left around from a previous project, so I put 3 1/2 gallons of the concentrated hydrogen peroxide in the pool and waited for the results. 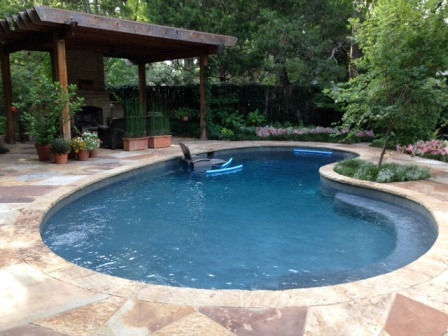 The label directions for the product we used (PerPOSE) is one gallon of product per 5000 gallons of pool water. The only change at first was a foaming that showed up in the skimmer. Within a few hours, all the algae were gone and the water was crystal clear - all with one application. It's been two weeks and still no sign of the algae returning. It also worked on the string algae in our koi ponds. For this I used the grocery store hydrogen peroxide at about ½ gallon of H2O2 per 1000 gallons of water. You can also use the grocery or drug store 3% stuff for treatment of Rose Rosette, powdery mildew, fire blight, curly top and other plant pathogens. If you chose the 3% product, use about 2 parts water and 1 part hydrogen peroxide in the mix. Or better still, for plant diseases, add it to Garrett Juice instead of using just water. Adding about 16 oz. of 3% hydrogen peroxide to 1 gallon of Garrett Juice (ready-to-spray mix) seems to work very well for controlling various plant diseases. Spraying straight 3% product will burn plants in hot weather and is a waste of money. 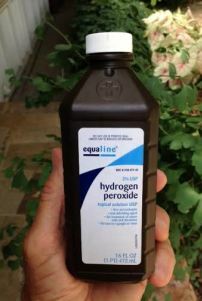 Whether using concentrated 33% product or grocery store 3% product, the spray coming out of the sprayer should be about 1% hydrogen peroxide or slightly less. It is amazing how well it works and there is no need for the toxic chemicals. Hydrogen peroxide is a chemical but just one atom different than water (H2O2 vs H2O) and degrades very quickly to water and oxygen. It will even happen in the containers after being exposed to air, so always use fresh material – even for those personal cuts and scrapes.